Andrea Lea and James Nigel are artists and academics with years of training and professional experience in the ceramics industry. So when the partners in life (and parents of three) decided to become partners in business, it was clearly a good match. Both are trained in the science of creating custom ceramics; their artisanal tiles are made to order, and each one is crafted exclusively by hand for each and every client. The tiles are simultaneously luxurious and unique, with subtle variations in every one. Andrea and James both believe that authentic tile is designed to create a place of refuge — a sanctuary that you can call your own. Seeing a natural kinship with our own interior design work, Lea Nigel Studios reached out to us. While at our studio recently to show some exquisite examples of their work, we took a moment to sit down and talk about their beginnings, designing in Michigan, and the future of their growing company. Jennifer Butler: Thank you for sitting down with us. You’ve both been working in ceramics for a long time. What brought you together? Lea Nigel Studios: We have a unique perspective on what handmade tile is; we are makers of functional and sculptural objects. James spent time working at the historic Pewabic Pottery in Detroit; he focused more on sculptural work, while I (Andrea) created more pottery and non-functional vessels. Our shared passion for clay brought us together, and it keeps us going. We’re very proud that we can preserve this authentic, ancient art for new generations to discover. JBD: Your work is so beautiful. How and why did you choose this industry in Michigan? LNS: We bought a complete gut rehab property in Northern Michigan. We wanted to install tile in our own home, and that inspired our journey — out of necessity rather than thinking business at first. We felt we could share our perception of how authentic, handmade ceramic tile can contribute to a home and interior design. We started Lea Nigel Studios to express our ideas about the relationship between form and surface; to use historical and contemporary references to create surfaces that resonate on a visceral level. JBD: What is your design process for creating such sophisticated tiles? LNS: Our design process starts with research. We absorb a lot of information from our natural surroundings, picking up cues for pattern and color inspiration. We’re interested in geometric tessellations — math inherent in nature — and we combine these into our design concepts. Our tile process begins with hand-carved prototypes to cast in plaster, creating our molds. We can use a mold about 35 times before we have to make a new one. Each mold creates a series. We hand-press each tile from a white stoneware clay body and then we hand-paint each one. We fire our tile twice — a bisque and a glaze firing — at a max temperature of 2232 degrees to produce the beautiful array of bright color we offer. JBD: Wow, that’s an incredibly intimate process with every piece. What are the considerations when designing new pieces or collections? LNS: We consider form and function while striving to maintain an authentic, handmade aesthetic when designing our tile. We’re trying to combine the artisan character inherent in ceramic tile with current trends in design. We believe that historical design is classic, timeless, and will always be relevant. It’s impossible not to be influenced by historical tile designs from the Middle East and North Africa. JBD: Yes, we can see the reference to historical patterns in your work, yet uniquely updated. We spoke earlier about the inherent sustainability of clay tiles. How do you integrate other sustainable practices in your business? LNS: That’s a great question. We recycle our clay and studio water, and we use non-toxic materials and glazes. Ceramic tile is very durable and will last a lifetime, so it is a smart, environmentally conscious choice. JBD: How do you stay relevant in your industry, and what are you doing to prepare for growth within your company? LNS: We stay current by educating ourselves about what is in the market for residential and commercial tile. We research what is happening on the forefront of the industry, from technology to design. Our studio is small now, but we’re so excited our company is growing! We can’t wait to expand our square footage, hire locally, and move the studio into a newer, larger space. Our “next big thing” will be more development in our sculptural and three-dimensional tile offerings. The concept of depending on sculptural surface quality, rather than relying on glaze, is an intriguing aspect we’d like to explore and share. JBD: That all sounds very exciting. We think your work is beautiful. You must be very proud of what you have built thus far. LNS: Thank you for supporting us. We’re most proud of our ability to persevere. With the vast array of tile available on the market for the consumer, we’re hoping designers and the homeowner support our endeavors. The authenticity in our work cannot be found in mass-manufactured or industrial-made tile. 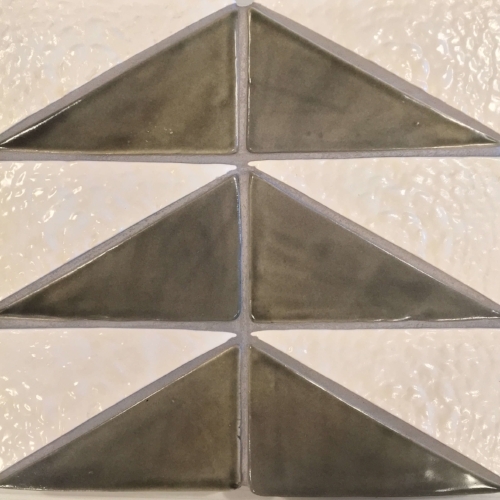 Our handmade tile presents a connection to the earth, to humanity, and to your interior space. We’re very proud of that. Designer Steve Howard listens to James Nigel discuss the process of hand-making tiles, at our design atelier in our Grand Rapids studio.